Panthers star Simon Lambert revealed his best performance of the season came during some of the toughest days of his life. Lambert piled up paid 16 points to help the city team collect a 48-45 comeback triumph against Ipswich in the Premier League Cup a week ago. But Lambert admits he very nearly did not ride following the premature birth of his first child, son Kai, three days beforehand. Lambert said: “I’m very happy with my form at the moment and the performance against Ipswich was especially pleasing given it came at a very tough time for myself and my family. “My son was born five weeks early last Thursday morning and then had to be rushed to the Special Care Baby Unit at Lincoln County Hospital in the early hours of Saturday. “We thought we were going to lose him at one point, but thankfully he is a little fighter and he is making really good progress now. “He is still in hospital, but things are looking much better and my fiancee, Sam, is doing brilliantly too after being in a bad way herself. I just thank her for blessing us with a little angel. “It has been a very emotional and difficult time, but the support from my family has been brilliant. Lambert and the rest of the Panthers side face a hectic Bank Holiday Monday with two Premier League meetings. They go to basement side Scunthorpe (2pm) before entertaining East Anglian rivals Ipswich again at Alwalton (8pm). They have called up popular guest Kenneth Hansen for both fixtures. 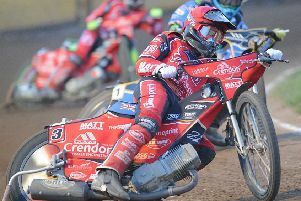 He steps in for number one Craig Cook, who has an Elite League fixture clash, in the afternoon before replacing Nikolaj Busk Jakobsen, who has been refused clearance to return from concussion, at night. Berwick rider Kevin Doolan is the stand-in for Busk Jakobsen at Scunthorpe while Panthers use rider replacement for the injured Tom Perry in both meetings. They have already claimed two emphatic victories over Scunthorpe this season – 64-26 at home and 57-36 away – in the League Cup. PANTHERS (afternoon): Kevin Doolan (guest), Emil Grondal, Kenneth Hansen (guest), Simon Lambert, Ulrich Ostergaard, Rider replacement for Tom Perry. PANTHERS (evening): Craig Cook, Emil Grondal, Kenneth Hansen (guest) Simon Lambert, Ulrich Ostergaard, Rider replacement for Tom Perry, Tom Stokes. SCUNTHORPE: Josh Auty, Josh Bailey, Ales Davies, Ryan Douglas, Andreas Lyager, Michael Palm Toft, Carl Wilkinson. IPSWICH: Paco Castagna, Nico Covatti, Ollie Greenwood, Lewis Kerr, Danny King, Morten Risager, James Sarjeant.